Two of Seagreens® wild wrack seaweeds lend themselves to a variety of culinary uses, from a baking ingredient which consumers say is better than salt, to a seaweed you can add warm or cold to vegetables and salads. Please click here to see the nutritional profile of each Seagreens product. Culinary Ingredient is the classic food ingredient - ready-milled grains of wild Ascophylum nodosum Human Food SeaweedTM for use in everything from soups to risottos, sprinkled onto almost any raw or cooked food. Used in baking it can replace as much salt as you wish. In 2010 research at Sheffield Hallam University’s Centre for Food Innovation found Seagreens to be a healthy natural replacement for salt (sodium chloride*). It is now used in some of the world's leading food brands. In 2013 the World Health Organization revised its guidelines to focus as much on the balance of minerals as the reduction of sodium. Adults should consume less than 2g sodium (5g of salt) but at least 3.5g of potassium per day. A person with elevated sodium and low potassium levels could be at risk of raised blood pressure. Currently, most people consume too much sodium and not enough potassium. 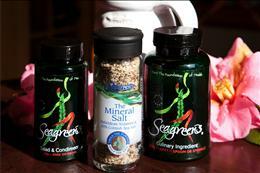 Seagreens provides a comprehensive balance of all the minerals. Salad & Condiment is larger dried pieces of wild Pelvetia canaliculata which can be used as they are, milled in a table grinder or soaked in cold water for use as salad, garnish or warm vegetable. Adds a subtle new taste and chewy texture in pastas and risottos. Seagreens are certified allergen free so are 'free from' and produced as a raw whole food with no additions or extractions. For the sake of clarity they are Diary Free, Gluten Free, Corn Free, Soy Free, Yeast Free, and Fish, Shellfish and Crustacean Free. 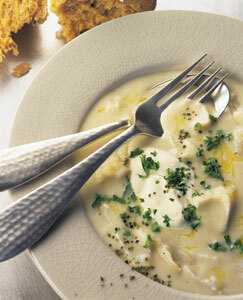 Many people using the GAPS diet find ways of incorporating Seagreens® culinary products - easy to do in almost any dish. Click here to a good guide to GAPS. *Sodium chloride: 400 mg per gram sodium. Seagreens 34.5mg per gram. Sodium chloride: 0 mg per gram potassium. Seagreens 18.2 mg per gram. There are lots of other good food sources of potassium, including dark leafy greens like spinach, baked potatoes in their skins, squash, yoghurt, fish, avocados, mushrooms and bananas. One way or another, Seagreens go well with any food!